As the Maker Movement starts to gain momentum, schools that are trying to find ways to foster the do-it-yourself environment can learn a few lessons from another nexus in the universe: public libraries. Dale Dougherty, founding editor and publisher of Make Magazine -- and the de facto leader of the Maker Movement -- has a vision to create a network of libraries, museums, and schools with what he calls "makerspaces" that draw on common resources and experts in each community. Libraries and museums, he said, are easier places to incorporate makerspaces than schools, because they have more space flexibility and they’re trying to attract teens with their programs. “Schools have already got the kids," Dougherty noted wryly, at the recent American Library Association Midwinter Meeting in Seattle. One day during the conference, dubbed Maker Monday, focused on the Maker Movement, which emphasizes learning by engaging in tech-related projects. Two packed sessions, one standing room only, were filled with librarians clearly fascinated by the potential of attracting teens (and even parents) to Maker activities in libraries. 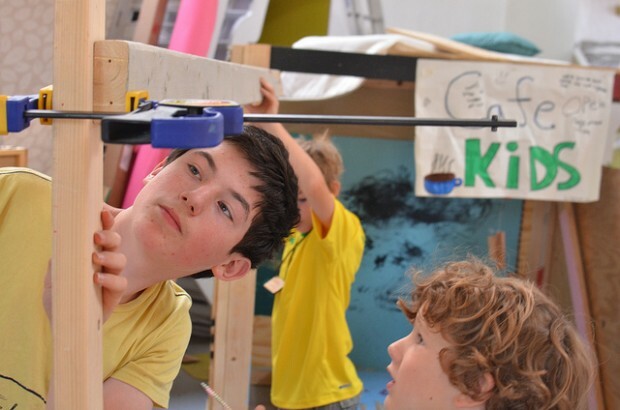 Schools can learn from libraries that participated in the inaugural Maker Camps last summer. The librarians speaking at ALA proffered seven lessons that apply beyond libraries to schools and other potential makerspaces. “Why are you here?” That was one of the most common questions asked of the staff at the Make Magazine booth at the ALA. The answer: one of the hardest things for people interested in making is finding an appropriate physical space, and libraries actually have that space. But not every space is alike, or even appropriate. Carla Avitabile of the Novato branch of the Marin County Free Library in California found some projects just aren’t suitable in certain activity rooms. For example, she said, they couldn’t do a glow-in-the-dark candy project because of the potential mess caused by boiling sugar directly above carpet. Travis Good, the co-founder of the Maker City Census, said he visited 68 makerspaces to develop his criteria for readiness. At the top of list for libraries? “Tolerance for noise,” along with the willingness to establish ongoing programs, have available Making tools (even items as simple as scissors), provide dedicated-use space, and availability of “dirty” space for woodworking or other messy projects. All are considerations for schools as well. 2) DO A PREVIEW RUN. Amber Creger with Arlington Heights Memorial Library in Illinois discovered it was really important to try projects ahead of time, prior to diving in as a group. In one case, they were making a do-it-yourself cardboard pinball machine. “Who knew the glue could burn,” she said. A trial run lets you work out the bugs before involving kids. Marin County’s Avitabile had one surprise as her young makers dove into a project. “Only one in four in our team of kids knew how to use a screwdriver,” she said. Don’t assume students have even the necessary knowledge of basic skills. Plan for some instruction. While Maker Camp provided descriptions for 30 projects in 30 days, libraries typically did one or two programs a week for a couple of hours each. And not every idea for a Maker project came from staff. “I ask the teens what they want to do,” rather than dictating all projects, Avitabile said. That approach is very much in the spirit of making. And with teens who come to her with new ideas, she tells them, “You have to help me do it.” Creger added that her teens decide their monthly programs. 5) REACH OUT FOR HELP. Not all the knowledge required for a successful making program comes in a kit or from staff. “Don’t be afraid to make friends” with those who are experts in areas in which you’re not, Creger advised. For one electricity project, she found an expert in Wichita who was willing to help. In the case of libraries, that expertise can also come from educators. “We’re working on developing a better relationship with our schools,” Creger said, noting that her library wants to work with the schools that have robotics clubs to do joint maker activities. Steve Teeri with Detroit Public Library partners with a local makerspace for a variety of different after-school projects, from bike repair to higher tech. “We learn from their mistakes,” he said. And kids learn because they have to go online to do research and figure out how to make what they want to make. 6. DOING BRINGS DOUBTERS ON BOARD. While not all involved may appreciate -- or even understand -- the maker approach at the start, “I was surprised at how quickly the staff bought into it,” said Creger. Those who were unsure learned with the others as they took part in creating the projects. 7. IT'S THE EXPERIENCE, NOT THE OBJECT. “You’re opening doors and windows” through the process, said Creger. And the positive aspects of the program have, in part, spurred Arlington Heights to plan a DIY corner where kids can check out maker kits, in addition to using a 1,700 square foot space in the center of the library for maker activities. Similarly, Wichita Public Library is in the design phase for a makerspace that Howerton hopes is built. Detroit Public Library’s HYPE makerspace is nine months old. Make’s Dougherty reminded the librarian audience that the Maker Movement, while also tied to schools because of its connection with STEM initiatives, is naturally aligned with them. “Like libraries, we’re at the intersection of information and experience.” And ultimately, he said, making is about learning -- and creating evidence of that learning. Frank Catalano is a consultant, author and veteran analyst of digital education and consumer technologies. He tweets @FrankCatalano, consults as Intrinsic Strategy, and writes a column for GeekWire for which he also sought out the tech at ALA. As a child, he used to frequent Radio Shack to find cool things to build that weren’t likely to accidentally catch on fire.